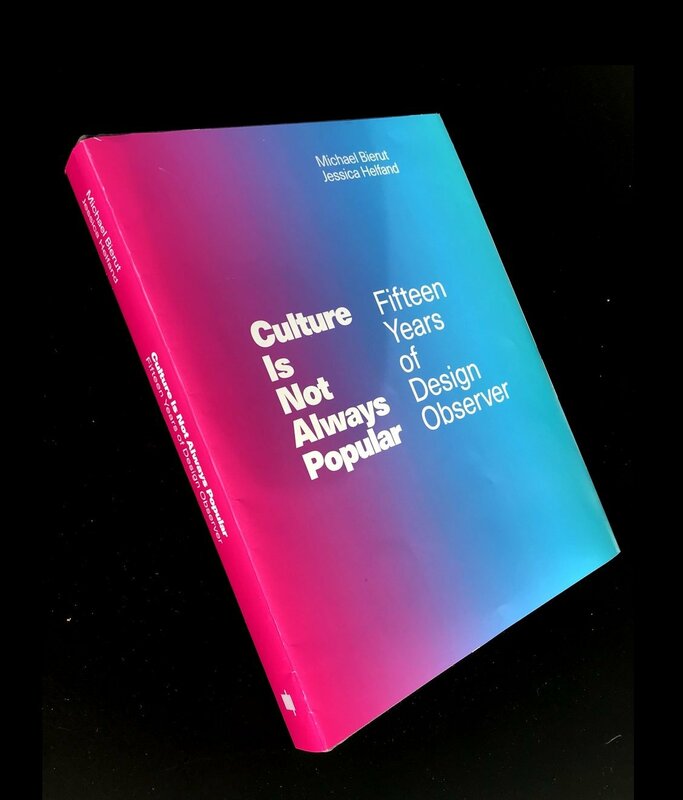 Over the last year, I’ve had the privilege of working with Jessica Helfand and Michael Bierut on a new book that is out today by MIT Press: Culture is Not Always Popular: Fifteen Years of Design Observer. The book, which I designed and co-edited, features 66 essays from Design Observer’s history, ranging from the timeless to the timely, the serious to the silly, and opens with a brand new interview I conducted with Michael and Jessica that looks back on the origins of Design Observer and how its evolved over the last decade and a half. I’m proud of the book and can’t wait for you to read it. It was a deeply personal project for me, and one that brings my love of graphic design design full circle. I found blogs before I found graphic design. Here’s the scene: An introverted high school student interested in art, architecture, and technology spends his free time designing homes with $40 DIY home design software purchased at a suburban Staples. He fills sketchbooks with drawings and writings, designs his own t-shirts, and begins tinkering with HTML after his family gets high-speed internet. He discovers RSS and starts reading blogs — short for “web log”! — about technology, the internet, and design. On November 2, 2014, he set up a Blogger account of his own and began posting almost daily. He never had many readers but the occasional comment would keep him going. Eventually the blogs he was reading and the topics he was writing about started to coalesce around this thing called graphic design. So many of his interests growing up suddenly had a name. His earliest memories looking at letterforms sitting in the front of the shopping cart in the grocery store with his mom? Graphic design. The signs he made to hang in his bedroom windows when he played store in elementary school? Graphic design. The newsletters he designed and edited with his cousins in middle school? Graphic design. The website he designed for the interior design business he started in high school with his friend Andy? Graphic design. He’d taken a career aptitude test at school a few years earlier and right behind architect, ranked graphic designer but it didn’t register. Growing up in the suburbs, he’d never met a graphic designer before. It was blogging that introduced him to this world, blogging that gave his interests a name. And perhaps most importantly, it was blogging that showed him other people were interested in the same things he was. He started devouring these blogs, reading them everyday when he’d get home from school. He tried to write like them, borrowing writing styles and responding to topics he found interesting. He subscribed to a lot of them, but his favorite was one called Design Observer. Design Observer was not the first graphic design blog but it’s one of the few that’s endured. Founded in October 2003 by William Drenntel, Jessica Helfand, Michael Bierut, and Rick Poynor, the site lived up to its tag line, “observations on design and culture,” casting a wide net around their subject matter, posting not just about design, but also about film, politics, books, and art. The posts were thoughtful and researched and the comments were often just as exciting and as interesting. It was not uncommon for those comments to be as well-written and as long as the posts themselves. All four of the founders had been involved in the design discourse before: Rick had started Eye Magazine, Bill and Michael edited the Looking Closer series, and Jessica had written for a variety of publications and a collection of her essays was released a few years earlier. They had all written for various publications over the last decade. But these mediums were slow — it could be months before an essay came out in print and when it did, you wouldn’t even know if anyone had read it. Blogs changed all that. Bill and Jessica had decamped to Connecticut from New York City to set up a new studio and they saw blogs as a way to engage in conversation in new ways now that they were removed from the city’s design scene. After recruiting Michael and Rick, Design Observer was born. There was no style guide and no editorial strategy. They wrote about what interested them and they wrote in their own voices. It was accessible and easy to read. As a young designer reading the site, I felt like Michael, Bill, Jessica, and Rick were part of my life. And as the years passed, they started adding more writers. One thing Design Observer doesn’t get enough credit for, in my opinion, is giving a platform to young designers and critics. For many writers we all know today — Mark Lamster, Alexandra Lange, Alissa Walker, Dori Tunstall — Design Observer was one of the first places they could write; a place to hone their voice and sharpen their gaze. The magic of Design Observer — and the magic of blogs in general — was the community that was formed around it. Unlike writing for a print publication, you could get immediate feedback. It’s hard to imagine in the toxic comment culture in which we now live, but the comments on Design Observer made for a vibrant — and civil! — community that brought together designers from around the world, from every stage of their career, to discuss, debate, and dissect. The field was smaller then. Design was still seen as a niche subject. Design Observer was prescient in this regard — they saw design not as something that lives in isolation but something that influences everything around us. This seems obvious now, when every major publication writes about a corporate rebrand and we live in a visually dominated world, but it wasn’t like that fifteen years ago. Design Observer bridged that gap, continually pushing outward and examining design’s role in the world. As the media landscape changed, so too did Design Observer; the term blog doesn’t feel sufficient anymore. Over the years, they included photo series and link lists, staged conferences and events, set up competitions and published books, and they now produce three podcasts: Design Matters with Debbie Millman and The Observeratory and The Design of Business / The Business of Design, both hosted by Michael and Jessica. As social media slowly took over the comments sections and other blogs began shutting down, the Design Observer podcasts feel like a return to form. The site started as a place for conversation and in a way, the podcast — where we literally listen two people talking to each other in an informal, accessible way — is a distillation of this mission. The more things change, the more they stay the same. My interest in graphic design has always run parallel with interests in writing and criticism. My earliest introduction to the field was watching designers write about their work and the work of others on their blogs. As a high student, I understood that part of being a designer was being someone who made work but also thought deeply about that work and its implications in the world. It was only after I was in graduate school studying design criticism — more than ten years after I started reading blogs — that I realized how profound the impact of these blogs had on my own understanding of design. Before studying design in school, before working as a designer, before returning to school, and before I became a teacher myself, there was Design Observer. Along with a handful of other blogs, this was my earliest design education. When I started Scratching the Surface, my podcast about design criticism, some of the first people I reached out to were the people I had been reading on Design Observer for the last fifteen years. The podcast, I guess, is an attempt to recreate that community I saw as a high school student. I hope this book is a celebration of that community. It’s a document of a specific era of design history, a record of the community that formed around it, and a time capsule of a blog that had an outsize influence on both the design profession and an introverted kid from Nazareth, Pennsylvania. This book would not be possible without the shepherding of Victoria Hindley and everyone at MIT Press, the editorial and administrative assistance of Betsy Vardell and Maya Lim, all the contributors to the site over the last fifteen years, and of course Michael and Jessica. Reading through the archives as we selected the pieces for the book took me back to those years when this site was my only connection to the graphic design community. I had so much fun rereading so many of these and hope you enjoy them too, collected in this volume. It was truly a labor of love. Fifteen year old Jarrett would never believe he got to do this. Jarrett Fuller is a designer, writer, educator, and podcaster. RSS feed.